Anyone who has ever undertaken a kitchen renovation knows that costs can add up quickly: in fact, the national average for high-end kitchen makeovers is now $53, 931 according to the Remodeling Magazine 2012-2013 Cost vs. Value Report. Because it is such a large investment, homeowners often want to ensure that their new kitchen will stand the test of time. Unfortunately what’s hot and trendy today may be out of Vogue as early as next year, making your kitchen look outdated before you have even really had a chance to enjoy it. Before you start your renovation, it is important to answer one question: who is the renovation for? The answer will help you determine what design choices you should make not only in the kitchen but also in the rest of your home. Renovations intended to update the property solely for resale purposes will need to keep in mind which design elements hold the highest appeal to the greatest number of people. They should be focused on getting the highest return on your investment and not on putting in the newest, trendiest sinks, appliances, and finishes. You will generally want to play it safe with color and opt for something with traditional appeal like white paint or light maple wood. Renovations done solely for your family’s enjoyment allow for a greater focus on current trends. It’s not a good idea to completely through caution to the wind, but you can make some decisions based on current trends without worrying that it will cost you when trying to sell. Most kitchen renovations occur not because the kitchen is worn out, but because it doesn’t look current, so try to avoid styling your entire kitchen around today’s hottest trends or else a couple years from now you may want to start all over again. 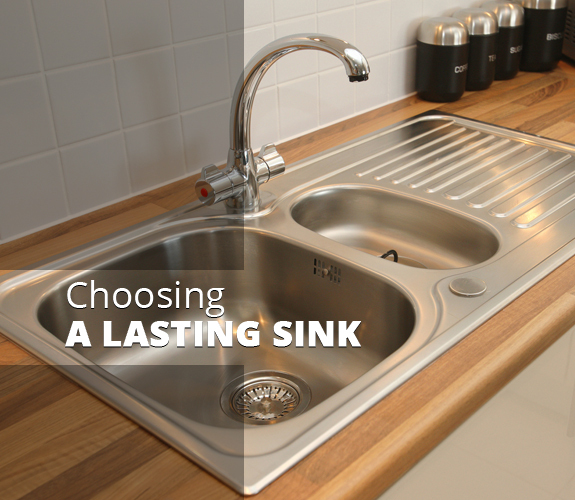 When it comes to kitchen sinks, we have seen quite the change in fashion over the last few years. In 2011-2012 everybody wanted apron-front sinks, but now these sinks have already passed out of fashion. The current trend in sinks is big, deep farmhouse sinks which leave plenty of room to wash dishes or even just stack them out of sight of your dinner party. But farmhouse sinks are likely to fade as more and more people jump on the bandwagon. So how does one choose a sink that won’t look out of date in just a couple of years? Stick to classic, practical designs that have been around for decades. A straightforward steel basin sink will complement any décor and look fresh for years to come. They are also available with a wide variety of useful attachments and features to make it easier to clean up and prepare food.